Benjamin got a minor cold, so I just had him pace me through my workout today and run only 6 miles total. The workout was 6x1K alternating down and up with 200 recovery which ended up being longer between repeats 2 and 3 due to a bathroom stop. I was able to keep it around 3:20 on the way day and 3:40 on the way up. Stephen almost got his mile record on accident running 7:35 on the little boy course. This means he probably needs to do a time trial soon to get the record for real. Otherwise usual distances for the kids. Usual runs, except did 3 hill sprints plus a 200 pickup with Joseph. With William and Jacob - did a hill sprint at the end alone. With Benjamin. He paced me through a hill sprint. With Benjamin and Joseph. A pickup with Joseph for 200, the a hill sprint with just Benjamin at the end. Went to the Junior High chess tournament in Park City. Julia won 3 games out of 5, Joseph only 1 out of 5. 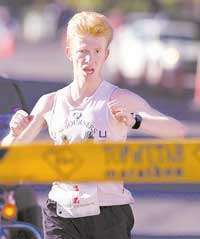 I ran 10 miles on the old Deseret News marathon course. Benjamin ran 15 at home with a 3 mile tempo down the canyon in 15:19 into headwind. Julia did 1 mile, Joseph did 2, otherwise the kids ran their usual distances. Alone in Parley's/East Canyon area. Usual runs except Joseph did only 2 miles as he was not feeling well. With Jacob, Benjamin, and Stephen. With Jacob, William, and Benjamin. Got some snow today, so the pace was slow. Usual runs for everybody except Joseph who did 3. Did 8 mile tempo with Benjamin. 3 down the canyon, 2 up, 3 down. He pulled me for the first 5, then took off. First 3 was 17:21, then 12:28 uphill, and 17:41 for the last 3. There was a mild wind blowing into the canyon, which made uphill easier than normal, and down harder than normal. Benjamin closed with 15:37 for the last 3. The kids ran their usual distances. Some kids did 400 time trial today. Stephen ran 1:37.5 (small PR, splits 22,24,27,24), William 83.5 (small PR I think, 18,21,22,22), Jacob 72.4 (PR by 0.3, 16,17,20,19), Julia 81.1 (small PR I think, 18,21,21,21), Joseph 70.9 (missed PR by 0.3, but overall a good development and a confidence builder as he has struggled recently, 16,17,19,18 high). Benjamin helped with the pacing in the 400s. I had Jacob run only 3 miles, wanted Joseph to do the same, but then he ran an extra mile with me making his total 4 today. Otherwise usual runs. Matthew's false start. Benjamin ran with him later in the evening. Most of this with Benjamin. Did a tempo workout with Benjamin today as part of a long run - total of almost 17 + the run with Matthew later. We did 2x3 down the canyon with long rest. The first one was after 5.4 warm-up, the goal was for Benjamin to run sub-5:00 pace, for me to run relax. He did 14:55 (4:54, 4:58, 5:03), I did 16:59 (5:39, 5:40, 5:40). We got some headwind in the last mile which made the effort harder. Benjamin got knocked down to 5:03, I was able to hold the pace, but the effort went up considerably - I went from enjoying a controlled pace to having to really push it to not slow down. On the second one I had Benjamin pace me. My reasoning in setting it up like this was to give him a confidence builder that he can run sub-5:00 pace, and then give him something endurance building that he can relax at while helping me in the process. By that time we got some more headwind, but Benjamin's presence counterbalanced it. I was hoping to run 16:30, but by around 1 mile I could tell that even with Benjamin's help, this much wind + fatigue from the workout would require more fitness than I had today. So I tried to not lose too much ground to the target 5:30 pace. I was able to run 16:36. Mile splits were 5:33, 5:35, 5:28. Younger kids ran their usual Saturday distances. Jenny did it in two installments due to the need to study for and take BYU Math 112 test. Did 3x1 down the canyon with Benjamin with half mile jog rest. My target was 5:20, his 4:40. I got 5:16, 5:22, 5:18, he got 4:40, 4:48, 4:37. He learned that if he started out the intervals in 17 for the first 100 as opposed to 15 they go a lot better. The purpose of the workout was to get used to faster speeds so we would not feel the speed barrier in the tempo runs as much. We were short on time at the end, so we did a mild tempo for part of our cool down. Younger kids did their usual distances on their own. Cool-down with a mild tempo at the end for about 1.18 miles with the mile split of 5:53 - the rest of the distance is estimated. 400 time trials today. Stephen ran 1:34.9 (PR, 22,24,26,24), Jacob and Joseph 72.3 with even splits per 100, small PR for Jacob, Matthew 2:02.6 (PR, 24, 29, 31, 38). Matthew suddenly stopped at around 320 mark, and it took us a few seconds to get him going again. He did not hold the hand, though. He ran 800 holding the hand in 3:59 earlier as well, which is his PR for holding the hand. Matthew decided he wanted to try 400 without holding the hand, and got a new record. With Jacob and William for the first 2.04, then the rest with Jacob. Jacob was on the move hit the last quarter in a little under 80. With Matthew. He did not hold the hand for most of it. Tempo run with Benjamin. 8 total consisting of 3 down, 2 up, and 3 down again. I gave Benjamin a target of 5:20,5:15,5:10, then 6:00 pace on the way up, then repeat the splits of the first 3. My goal was to follow a similar pattern. Benjamin was able to hit the pacing pretty much spot on: 5:19,5:14,5:11,6:00,5:56,5:21,5:12,5:05 - total of 43:18. I got 47:08 with the following splits: 5:47,5:44,5:42,6:19,6:25,5:50,5:45,5:35. This was the best 8 mile tempo this year for both of us. Younger kids ran their usual distances on their own. During the cooldown Benjamin and I met Kacee Houle, Nate Houle's wife and ran with her for about half a mile. Utah Elementary Chess Championship today, so we ran in the evening. In the chess championship, Joseph got 3.5/6 (6th grade), Jacob 4/6 (4th grade), William 5/6 (2nd grade, 5th place), Stephen 2.5/6 (kindergarten). We were one point short of getting a trophy in the school division competing as a family against schools. Seems like this happens every year. We just need to get a little bit better... Next year we are losing Joseph and hopefully getting Matthew if he can learn to play chess by then. Running wise, chess playing kids ran reduced distances - 2 for Joseph and Jacob, 1.5 for William, and 1 for Stephen. Otherwise usual distances. Benjamin and I did 15 at an easy pace. With Matthew, Joseph, Jacob, William, Benjamin, Stephen, and Jenny. Wrong button press. Need to fix Fast Running Friend so I can easily delete those. With Benjamin, Stephen, and Jacob. With Benjamin - did a pickup on the hill. Did a workout with Benjamin. 3x1 mile down the canyon with 0.5 recovery jog. I did 5:20,5:20,5:17. Benjamin struggled to hit the target pace of 4:40 in the first two intervals, but then woke up on the last one - 4:46, 4:44, 4:36. Then we did a light mini-tempo for a little over 0.75 at the end at 5:52 pace. Usual distances for the younger kids. Cool-down with a mini-tempo at the end. 600 meter time trials at the Orem High track today. Everybody got a PR. Benjamin helped with pacing. Stephen ran 2:32.8 - splits 50, 51, 51. William 2:09.8 - splits 41,45,43. Jacob - 1:52.6 - splits 37, 37, 38. Joseph 1:51.8, splits 37, 37, 37. Benjamin's assignment was to run 1:48 as evenly as possible - he got 1:49. I stayed with Jacob, then caught up to Joseph. With the gang including Matthew. Paced Joseph and Jacob - with Benjamin. Mostly alone - first little bit with Benjamin. Usual runs, except Stephen got a course record on the 2.04 course running 16:40. With Benjamin, Stephen, Jacob, and William. With Benjamin, Jacob and William. Benjamin and I did 3x1.25 in the canyon going down, then up, then down again. I got 6:40, 7:38, 6:52. He got 6:00, 6:52, 5:57. Then we did a mile+ pickup during the cool-down at 5:35 pace, which was rather ironic - I was essentially running my interval pace, but it felt a lot easier because I had Benjamin with me. Kids ran their usual distances, except Julia who fell after running about 1.5 and twisted her ankle. She will be out for a few days. Cool-down with a pickup at the end. Today Benjamin was endowed in the Provo Temple. Running wise, the kids ran in the morning, but Benjamin and I ran in the afternoon when we got home. It was raining. We ran 15 miles with a 3 mile tempo on the 3 mile stretch from Nunn's Park in 17:21 (5:54, 5:49, 5:38). It felt good in spite of being wet. This week for some reason every time I ran with Benjamin it was way easier than when I ran alone - that is the case every time, but for some reason this week the difference appears to be more than normal.